If you're looking for puff pastry dessert recipes, you have a lot of options. While puff pastry is a simple ingredient, it can be transformed into countless delectable desserts, many of which are very easy to prepare. Puff pastry is a type of traditional French pastry that consists of many, many layers of soft dough folded repeatedly and then rolled very thin. When you cook this kind of dough, all of the layers puff up and increase in size by up to twenty times. This has earned it the name puff pastry, since it literally puffs up to much larger than its original size. While it can be a chore to make your own puff pastry, it is actually a very rewarding experience. If you do not want to make your own, it's easy to find premade puff pastry at the grocery store, usually in the freezer section. Phyllo dough is a specific kind of pastry dough. Originating in countries such as Greece and Turkey, phyllo dough is paper-thin and puffs up in a similar way to the French puff pastry. You can wrap phyllo dough around almost anything and turn it into a fancy dessert, simply by following the directions on the box. Puff pastry dessert recipes are easy to find on the Internet, but some are more simple that others. 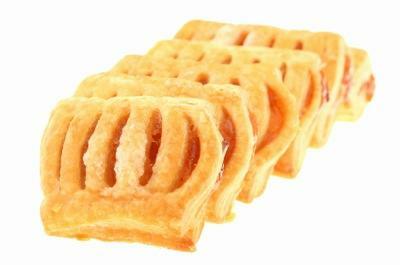 Palmiers are a kind of cookie made from traditional French puff pastry. When they are done, they should look similar to a palm leaf. All you need to do to make them is fold the dough over a few times, sprinkle the cookies with sugar and bake! These crunchy cookies are fast, simple and look very elegant. Palmiers make a great presentation for a party, and they look like you spent all day slaving away in the kitchen. Kids love the cinnamon-sweetness while adults love the crunchy, flakey texture. Note too, that palmiers go particularly well with after dinner espresso. 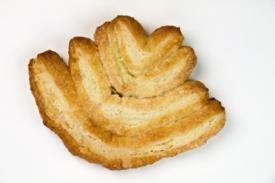 Palmier cookies look like palm leaves. Thaw out puff pastry in the refrigerator, making sure it stays chilled. You need to keep it cool, and if it gets warm and sticky, put it back in the refrigerator for a while. Your puff pastry should already be about 1/8-inch thick. If it's thicker, roll it with a rolling pin until it is 1/8-inch thick. Preheat your oven to 400 degrees at least 30 minutes ahead of time. Spread sugar in a thin layer on your clean countertop. Lay out one sheet of pastry, keeping the other cool in the fridge. Sprinkle the top with a thin layer of sugar. Take the left and right sides of the dough and fold them in towards each other to the center. Press down lightly. Take the folded edges and fold them in to meet in the center as well. Next fold them together like closing a book. The dough should not be in a U-shape. Cut into 1/2 inch slices with a knife and place on parchment-covered cookie sheet. Sprinkle with a light coating of cinnamon sugar and place in the oven for seven minutes. Turn cookies over and sprinkle with sugar again. Bake 4 minutes, until center is done and edges are golden brown. While the first cookies are baking, prepare the second sheet of dough to the directions above.